Fused silica is a glass form of silicon dioxide, a chemical compound that occurs naturally in quartz and many types of sand. Unlike quartz glass, fused silica is entirely synthetic when produced at an industrial level. Typically manufactured using silicon gas, fused silica is the most technically pure glass available. Fused silica has a non-crystalline structure that lacks long range order at an atomic level — standard for glass materials. Its three-dimensional structure is highly cross-linked, which accounts for its low coefficient of thermal expansion and high use temperature. Its superior ultraviolet (UV) properties, such as UV transmission, are a result of the specialized methods used for its production. Due to its chemical composition and production method, fused silica exhibits excellent thermal properties, most notably a low coefficient of thermal expansion that varies little over different temperature ranges. From -100 °C (-148 °F) to +200 °C (392 °F), fused silica’s thermal expansion coefficient averages at 0.48 x 10-6/K. Focusing that temperature range slightly, its coefficient in the 5 °C (41 °F) to 35 °C (95 °F) temperature range is an average of 0.52 x 10-6/K. At a higher temperature range, from 0 °C (32 °F) to 200 °C (392 °F), the coefficient is an average of 0.57 x 10-6/K. Such a low coefficient of thermal expansion across all temperature ranges also allows for a very high resistance to thermal shock, making fused silica glass ideal for applications that experience temperature fluctuations. By comparison, the lowest known coefficient of thermal expansion among metals, found in a nickel-iron alloy, is twice that of fused silica’s. When measured at ambient temperatures of 25 °C (77 °F), fused silica has a thermal conductivity of only 1.38 W/(mK). Among the lowest thermal conductivities of known solid materials, this makes fused silica glass an excellent choice for thermal insulation applications. By comparison, the above-mentioned nickel-iron alloy has a thermal conductivity about 10 times lower, at 10.5 W/(mK). Standard silicon’s is 100 times lower, at 148 W/(mK). Fused silica also exhibits strong optical properties, particularly in the infrared and ultraviolet regions of the light spectrum. These properties can be affected by both the purity of the material and the manufacturing process, so some variation does occur; these variations can even be intentionally introduced, depending on the desired end use of the glass. 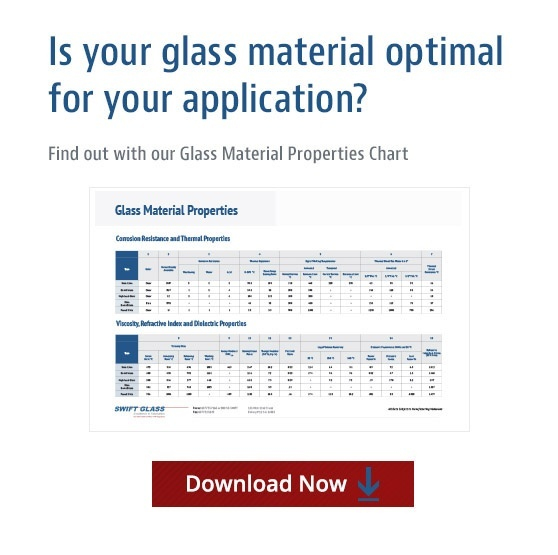 To learn more about fused silica and other popular types of glass, download our Glass Material Properties Chart.